You are Traveling! We wish you an outstanding trip! This exceptionally well-designed Universal Charger Adapter will take care of your devices while you are on the road. The sleek pouch bag is on us! This International outlet adapter Easily & safely adjust your electronic gadgets to plug into different socket shapes found anywhere you travel! It covers more than 150 countries around the world! Charge up to 3 devices at the same time: with 2 powerful USB ports (2100mA, 5V) for fast charging and 8-hole socket for global use. (2100mA, 5V) for fast charging and 8-hole socket for global use. This International outlet adapter Easily & safely adjusts your electronic gadgets to plug into different socket shapes found anywhere you travel! It covers more than 150 countries around the world! Charge up to 3 devices at the same time: with 2 powerful USB ports (2100mA, 5V) for fast charging and 8-hole socket for global use. TAKES CARE OF YOUR DEVICES high quality polycarbonate fire retardant body. Inside nickel brass for excellent conduction and long lifetime. It has an 6A over load fuse and a spare fuse. The fuse protects your devices from an overload or current surge. 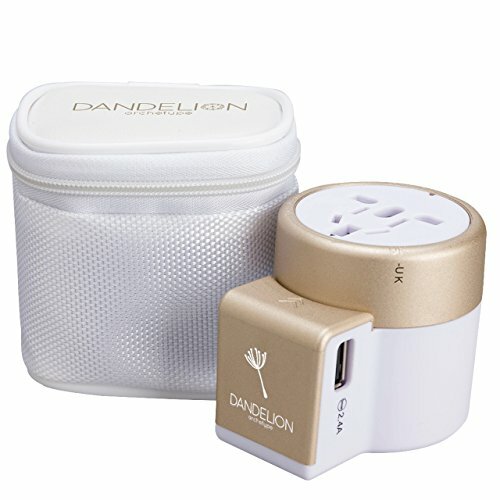 PORTABLE & EASY TO USE International Power Plug adaptor. Just rotate the face to your destination and the plug prongs will switch! No confusing tiny levers, fragile slider knobs, locking or unlocking. It is compact and comes in a handy pouch bag! Easy to carry on your trips. 2.20" wide X 2.36" long X 2.87" tall. Weight 0.30 lbs. AMAZING GIFT If you are not traveling, but looking for a great gift; this is a really cool opportunity! Travel accessories such as this International Charger adapter always come handy! This one is very sleek, easy to use and has top of the line specs. It is also handy at home, since it has two USB charging ports. SPECIFICATIONS: Compatible with 100 to 250Vac input, 6A MAX. (660W Max. at 110V,1440W Max. at 240V). USB Output 5V, 2100mA.CERTIFICATIONS: CE, RoHS & FCC. IMPORTANT: It is not a Converter. It does not covert voltage. Do not use with high wattage appliances such as hair dryer or hair straightener.